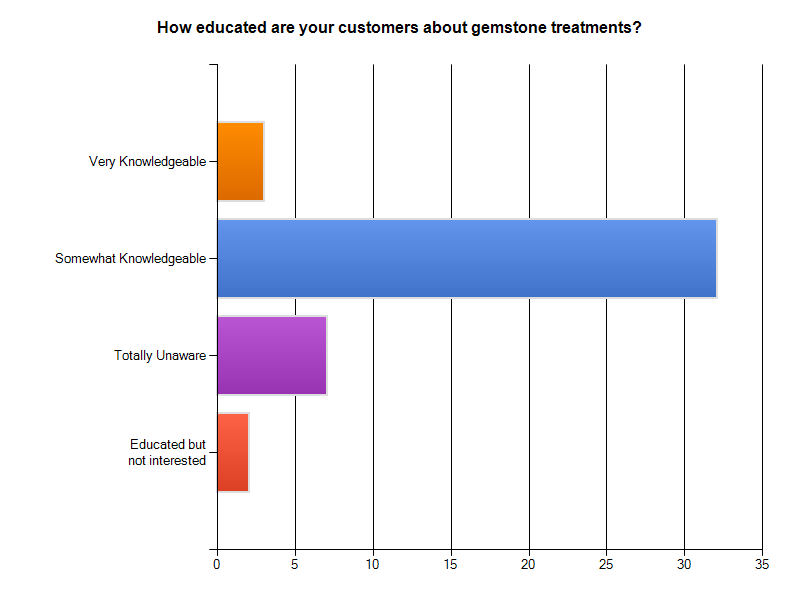 Many of you (203 to be precise) have participated in our survey on gemstone treatments. Thanks for your in-put. We welcome everybody to dig for details or special interest topics. See details below. Two out of three professionals were optimistic about the future of the trade. Consumer spending habits were seen as biggest thread. Regarding treatments, only spinel has maintained a somewhat pure image, but no variety is above suspicion anymore. 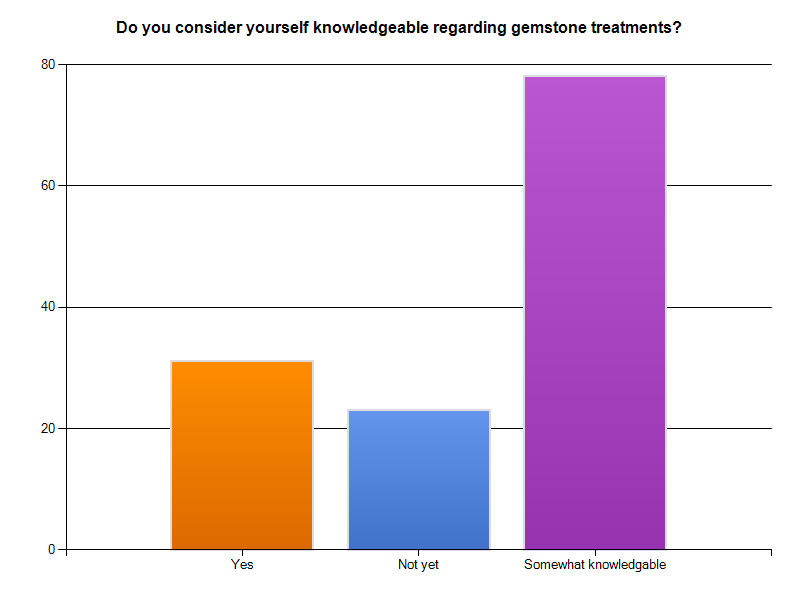 While all consumers thought that testing for gemstone treatment is the sole responsibility of the seller, most professionals said that buyers are, or at least sometimes ought to be, willing to pay between 5-10% of the sales price for a certificate. 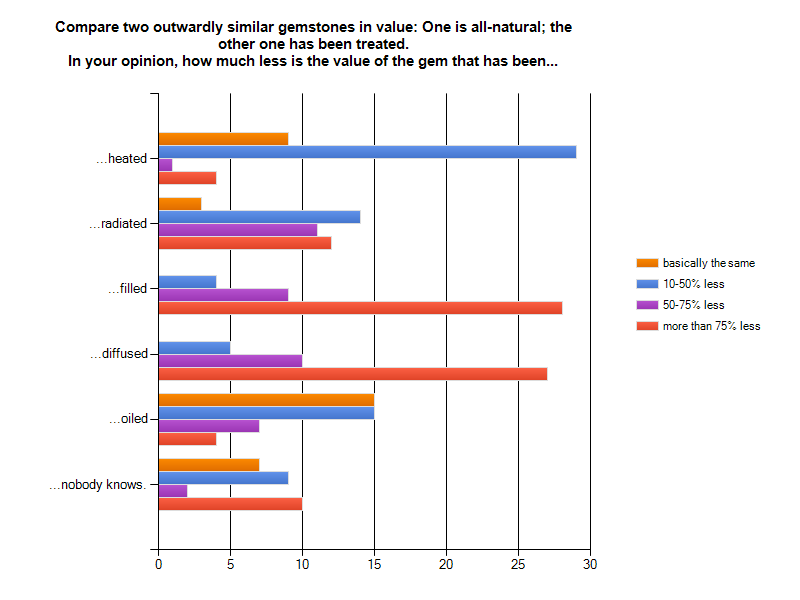 On average, participants estimated that a treated gem is 50-60% less valuable than an, outwardly equal, all-natural gem. This number, however, deserves differentiation. 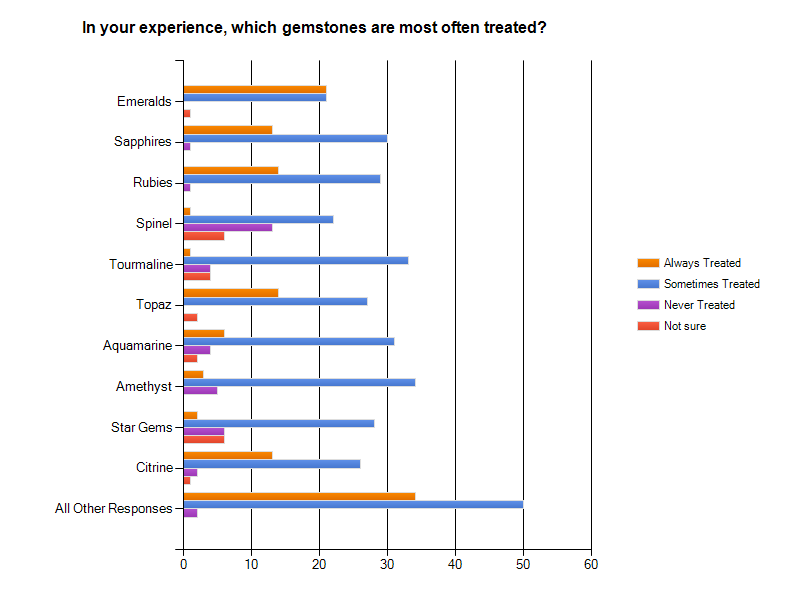 The following table shows the loss-of-value which consumers and pros thought a treatment "inflicts" on a gemstone. 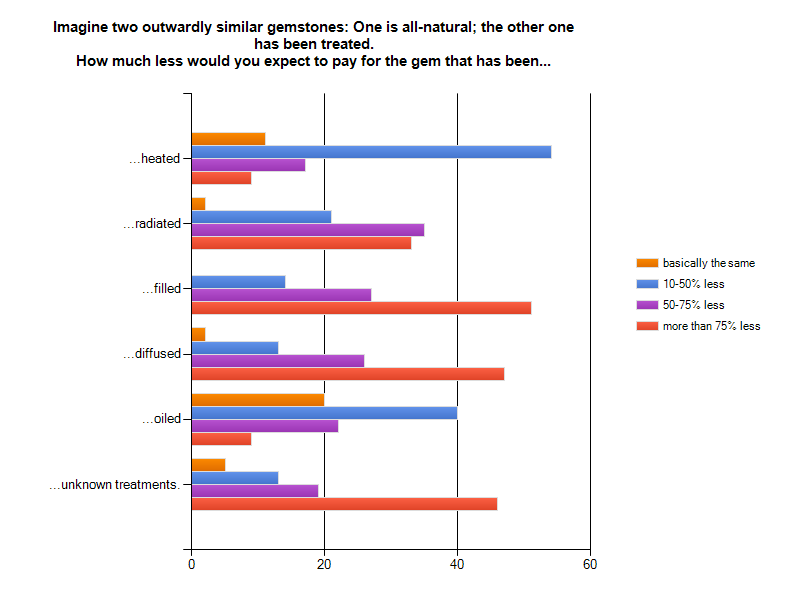 Reading Example: Compared to an all-natural gem, consumers would expect to pay 35% less for a heated gemstone. 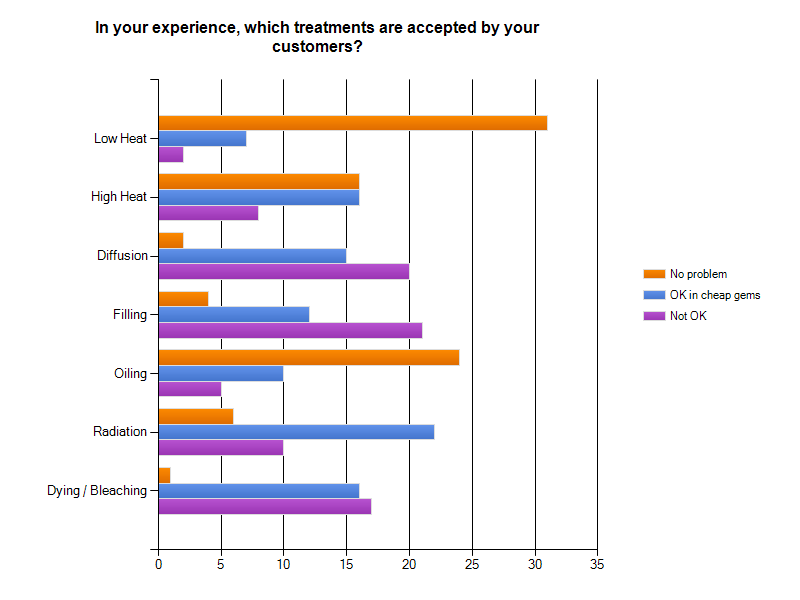 Professionals estimated the value reduction from heating at only 30% (all else equal). All-in-all, the time of innocence, or ignorance depending on where you stand, are over! Consumers have made their homework and know what they buy, or won't buy, or if at what price. 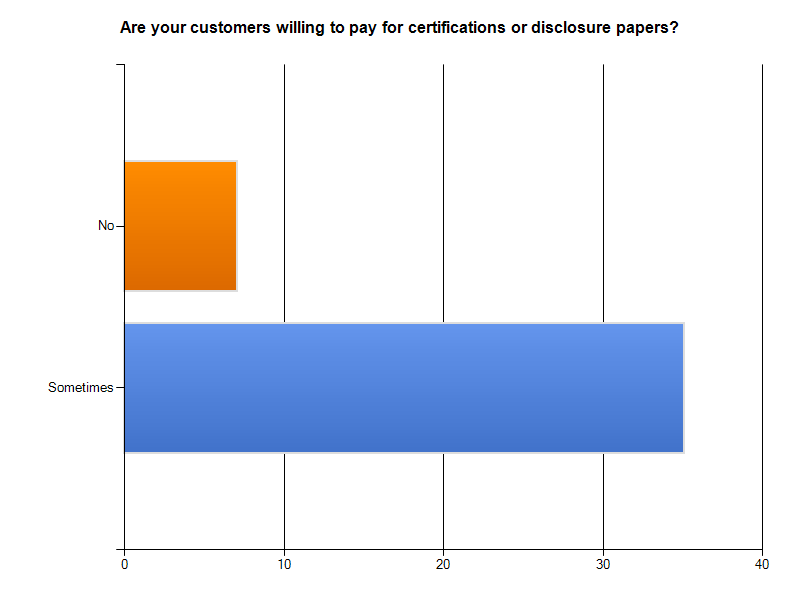 Professionals will have to keep up-dated and offer full disclosure. 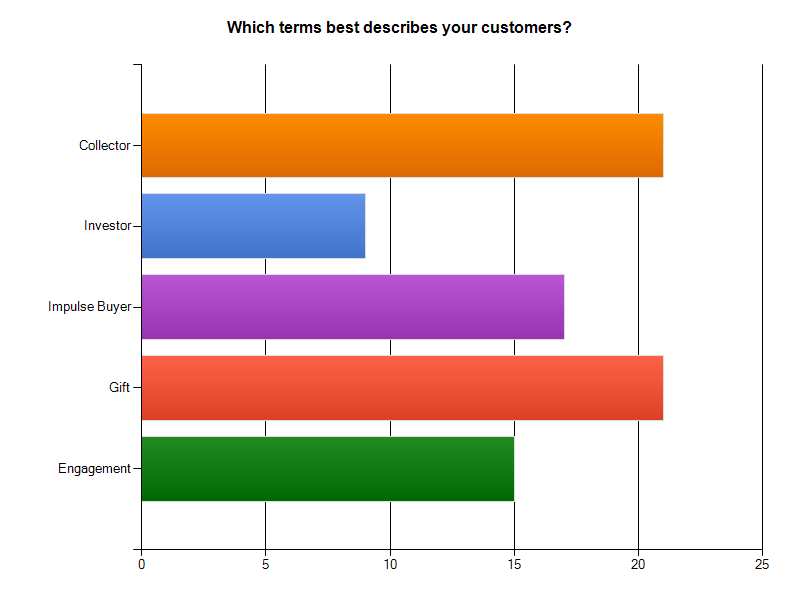 We will improve and repeat this survey next year and compare the results. We also heard from faceters, gemologists and appraisers. They were considered as professionals. Others: jewelry repair services, gemstone identification services, wholesalers and gemcutters. "The closer to retail, the less they care." "Some are aware but many are clueless. Most don't care if treated only that they know it is and that it is a permanent treatment." "Almost any gemstones are sometimes treated now. Lots of clarity enhancements going on on everything from spinel to rubies to even amethyst and garnets." Rubies,sapphires, emeralds and citrine should be considered "very often treated". Tanzanite and Aquamarine could be considered almost always treated. "I even prefer my pearls be uncultured." "As I'm the guy discovering and complaining about the treatment most of my customers are surprised, some disappointed, some could care less." "Mostly no problems as long as it's disclosed and the treatment is permanent." "With full disclosure most treatments are accepted but not by me." "This is not a response about which are accepted by my customers, it is a response that reflects what I accept. I will NOT sell stones that are diffusion treated or dyed. Filling is only acceptable in emeralds as the fillers tend to hold up better than oiling. I won't sell any other filled stones. Since I am the professional and my customers know it, they accept what I will put up with." "This is highly variable not only for the quality level but for different classes as well. I will assume the stones are high quality high end and the oil issue as far as I know of is emerald specific and a completely different playing field." "Heated is typically like 10% or so less, not by much in most stones. Irradiated can vary since in most cases, like Cobalt-60, it is not detectable. Filled is a tricky answer... normal clarity enhancement filling could be less then 50% difference, but these stones that are more composites could be more then 75%." "I've never noticed treated gems selling for less." "Luxury goods have always been with us and always will." "The purchase of fine jewelry and colored stones has a long way to go, but eventually the era of beads and irregular cabachons will pass. Maybe the integrity of the profession will have sorted out by then. Face-to-face will surpass e-bay as a profitable market. Collectors will come back slow because of the alternative choices, but a mineral crystal beats a rock any day." "I think the industry is going to need to recast the whole class status angle with the eco-green angles. Many industries will be affected but gemstones especially. There will always be wealthy people who want to decorate themselves, perhaps not so ostentatiously as in the past. High quality though will never go out of style." "Too many undisclosed treatments, especially with newer treatments, & even when asked about treatments accurate answers are avoided; too many vendors charging top grade prices for inferior material." 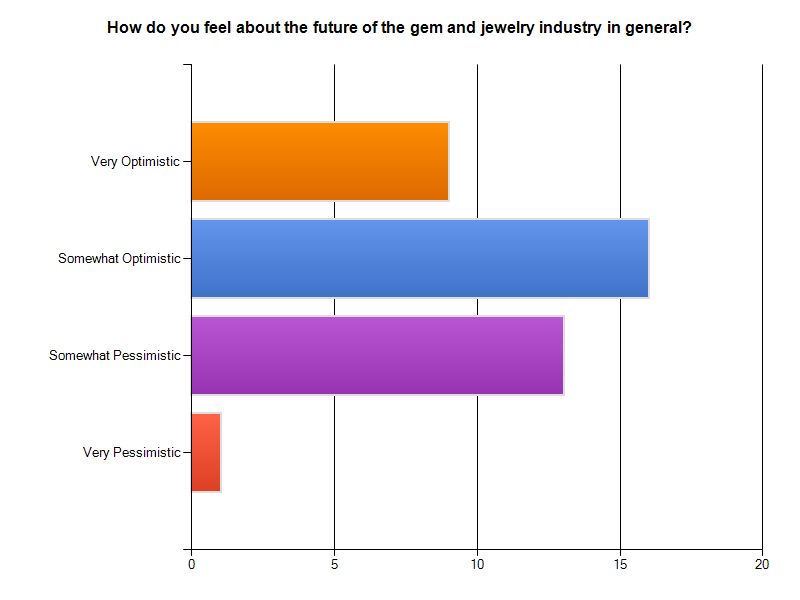 "The synthetics and gem treatments are the biggest disservice to the gem industry today. It has cheapened the word gemstone and now there is no true meaning of precious gem anymore but only suspicious and shaky at best." "Fraudulent or purposely avoided disclosure(s) .... impact value and resale value of finer (higher end) gems." "The andesine scandel and Dye-fusion of gems must be admitted and credited under 'treatments'. Local trade between artisans and gem merchants should be facilitated, somehow, and natural mean mine-colored...not mined then colored." 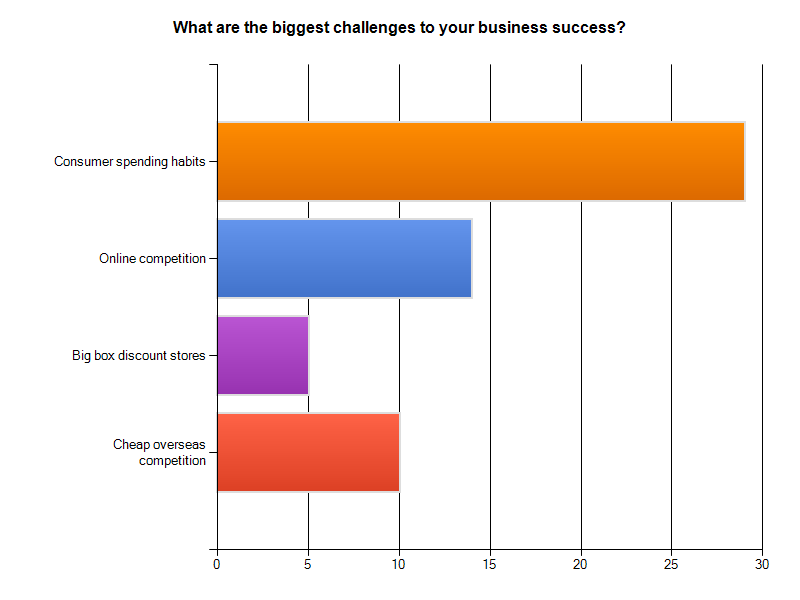 How do you meet the challenges facing your business? "It is very hard. I am furthering my education which is probably the best weapon against these crooks. Also, I have a extensive gem testing lab on-site to test my gems." "Education when possible, however I feel many potential customers are so interested in "getting a deal" that they never get to the old fashioned honest dealer who is a connoisseur and experienced collector who can guide a buyer through the market mine fields." "You can lose a sale talking scandals and treatments when the buyer just needs horoscope gems while a rock-hound will expect you to be current with trade info to take you seriously." "Work with lower cost metals and stones to appeal to all market areas. As for cheap overseas competition, since most all of it is heavily treated, meet the challenge by consumer education." "I get rough through reputable sources and cut them myself." "Offer personalized service, and quality products." "I sell branded stones and only jewelry I make myself. No one can buy my goods elsewhere." "Have studied much, but there is MUCH TO LEARN." "I am in the serious learning stage. Your site has been my education." "Learning, now so much more than I thought there was to know, just enough to realize my ignorance." "I soaked lead glass filled rubies in white vinegar for a week, watched them disintegrate." "It is a new DAY EVERY DAY, it is totally impossible to stay up with all of the treatments." "Who still aspires to untreated emeralds, or care about untreated amethyst, tanzanite, tourmaline or beryls? Who doesn't feel worries of treated spinel or stars superfluous, stilll..."
"I started my gemstone collection with spinel because it is a gemstone that does not take to treatment according to my research." "Nothing is always treated or always untreated." "I have seen unheated tanzanite, just never unheated high quality (color wise) tanzanite." "I know most citrine are treated, but that they can occur naturally. As to question above, I try to only get untreated, but some pretty much only come that way (blue/purple Tanzanite)." 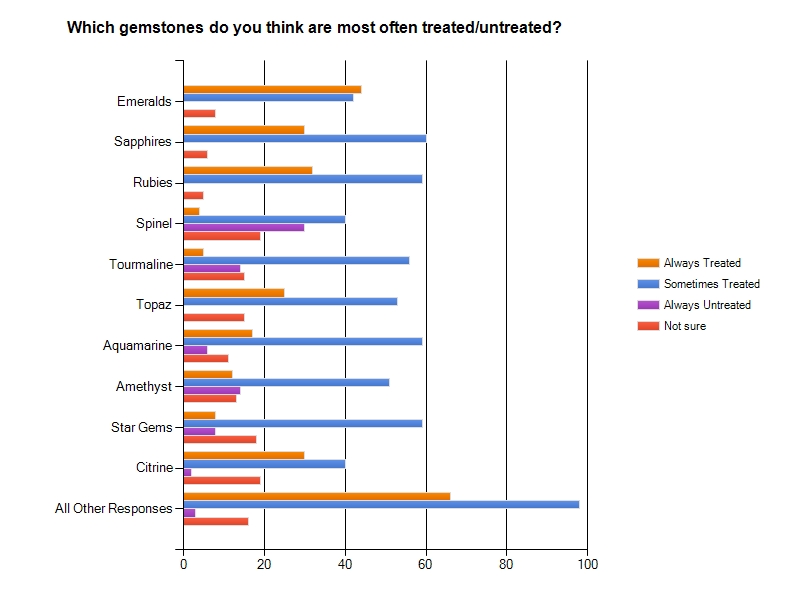 "I've ticked 'Always treated' for most gemstones, as I believe the majority of what's available in the market today are treated in some ways - be it a gentle heating or more intrusive treatments like irradiation, diffusion treatment etc etc. That said I also understand that there are sellers (such as yourselves) who specialize in untreated gemstones." "It is impossible to determine some of the treatments. The only way to be absolutely sure is mine the material yourself." "You can find untreated stones, but it is very difficult." "Depends on the stone. I would expect a premium on an untreated ruby or sapphire, but would be willing to buy heat only on these, at a reasonable price." "Can't imagine that I would knowingly buy oiled, filled, or diffused gems unless they were super bargains and very inexpensive. I'm seeking stones I can enjoy and pass on for generations." "I'd suspect some treatment if a stone looks to be better quality than its price. In other words, great "bargains" usually aren't." "I worry about toxic chemicals, and their effects of both the owners of gems, and the gemcutters, the miners, etc." "Depreciation of the value (due to treatments) also depends on the gemstones as well, I think... eg I understand that the value does not differ much between heated and non-heated/treated aquamarine (though I do prefer the non treated variety, of course)." " I hate the description "standard treatment for the stone", and snotty retailers who look down their nose when you ask them if the stone has been treated and say "we only sell top quality", which doesn't mean a thing......Luckily our town has a wonderful GIA gemnologist who likes to talk about gemstones when he has the time!!" "never know unless gem has paper work from a known lab." "...always assume treatment unless shown proof otherwise." "I NEVER shop chains, at any price point, for gems. Love family/independent businesses." "Retail jewelers are missing a market at best, at worst they may destroy the reputation of colored gems having value. Would be willing to see dealer tack on 160-170 USD for GIA/GRS report or >100 for GIT/AIGS report." "...need to be very wary for reputable dealers." 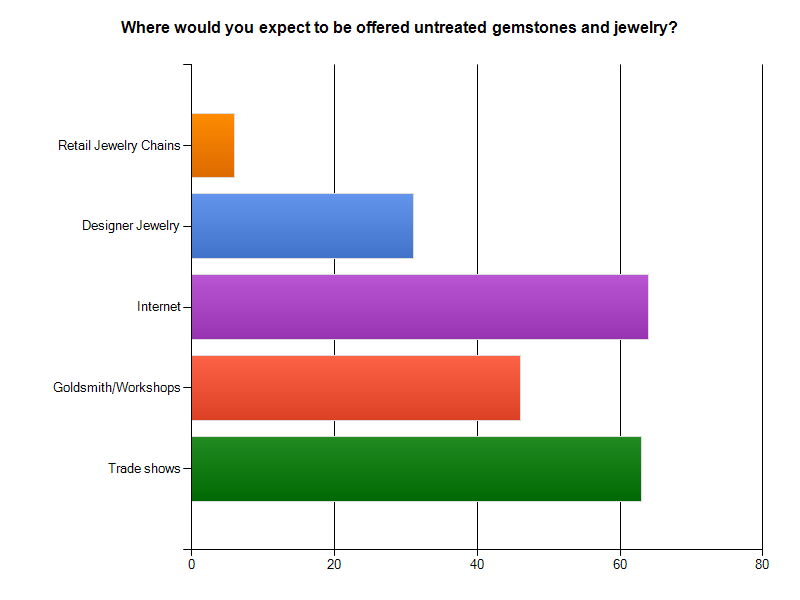 "There is a big difference in where I would "like" to expect untreated gems and where I actually expect them." "very rare and difficult to find trustworthy source"
"Trade shows should be more honest face to face. 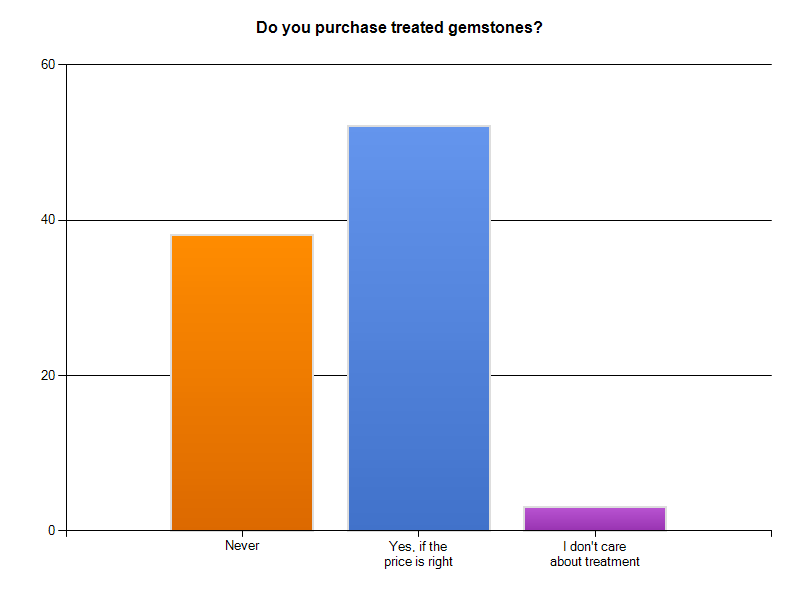 Would expect them to tell a customer if a gemstone was treated. Do not trust the internet, except YOU." "Connoisseurs buy untreated gemstones and jewelry, perhaps they're like organic food, or gourmet cooking; deserving a premium." "Wild Fish Gems is my trusted internet site for untreated gemstones." "I wouldn't expect to be offered untreated jewellry anywhere any more, except by a GIA gemnologist who can actually tell the difference. Even the high end sapphires seem to be heated. Perhaps you could get some real stuff from a goldsmith or a trade show, but as Joe Public isn't not exactly easy for me to look there, and I can't go shopping with a refractometer and a high powered microscope in my pocket even if i did know what I was looking for!! 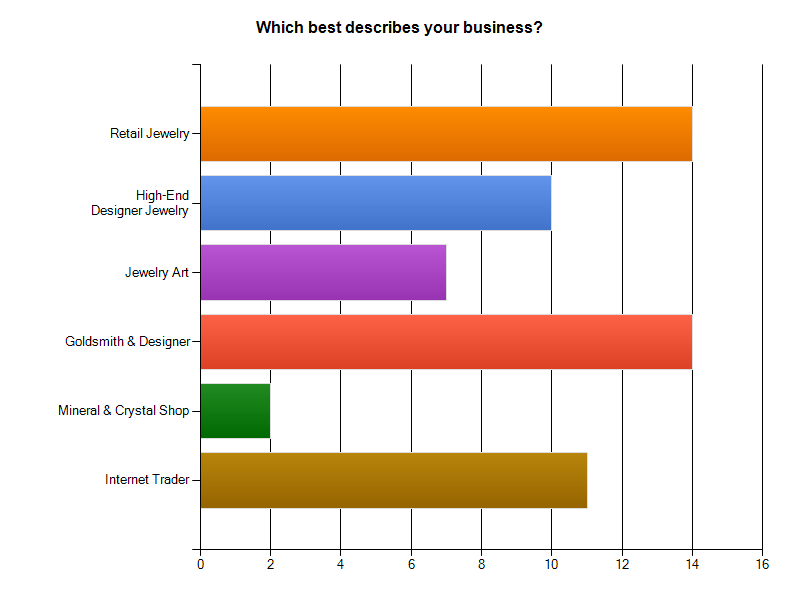 So, no GIA cert, no purchase and I'm not rich so I just by pretty crystal nowadays, and enjoy looking at your website." 100% of responders felt that testing and disclosure of treatments was the sellers responsibility. 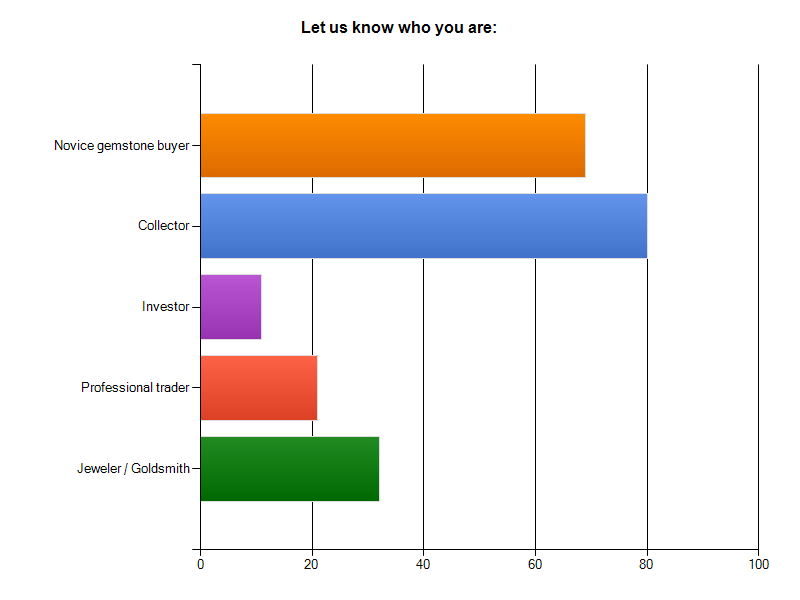 Wild Fish Gems would like to thank the following colleagues for contributing to the success of our gemstone treatment survey.